After the TADA incident, I'm very much convinced to fix the clutch issue. The issue is that the clutch arm under the body got worn out and requires replacement. I also noticed some minor wobbling whenever I hit something on the road while speeding up the jeep. So my mechanic observed couple of things that requires attention. Today I did the purchase of spare parts to fix the problems. By next week the jeeps minor issues will be fixed. 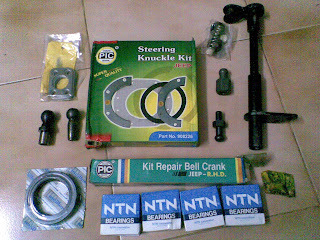 I am from Malaysia, Mahindra difficult to find mahindra or spare part of mahindra. U have catalog for mahindra can u share with me. I dont known to start for my first mahindra. But anyway l like to drive mahindra classic on the Malaysia Road. My email is rgp100k@gmail.com. Thank U.